We have partnered up with PSE® to bring you the PSE® ULTRAREST™. If you are shooting a PSE® the only rest that can beat our top of the line HDX model is the custom PSE ULTRAREST™. Combined with a PSE® bow you can’t beat the performance, fit, and look of the PSE ULTRAREST™. 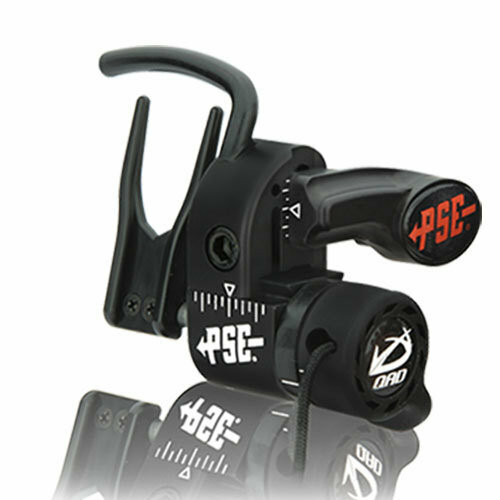 With the rest designed specifically for PSE® we were able to cut out unnecessary weight, parts, and adjustments. This also allowed us to achieve the quickest tuning times and experience each bow’s optimal performance. With the rest uniquely sporting the PSE® look and logo, you won’t find a better match for your bow. Each rest is designed, manufactured and assembled from start to finish by the hands of hard working Americans. Which have helped build it’s reputation as the leading arrow rest in the industry. Check with Authorized bow dealers for compatible bow models. Lower valley launcher for perfect berger button hole alignment with no launcher – bow shelf contact. Custom mounting block machined in the shape of the BowTech® logo. BowTech® logo decal hides mounting block bolt. Seemless fit to BowTech® risers. Non slip mounting block system. No set screw required. Lock-Down Technology guarantees no bounce back and total fletching clearance.